An International Space Station school contact has been planned February 19 2013 with participants at 4th Dimotiko Scholeio Chaidariou, Chaidari (near Athens), Greece. The event is scheduled to begin at approximately 14:06 UTC, which is 16:07 CEWT. The contact will be a direct operated by J41ISS. Interested parties in Europe are invited to listen to dowlink signals on 145.800 MHz FM. The contact will be conducted in English. AMSAT-NA President Barry Baines is pleased to announce that effective August 1, 2012, Frank Bauer, KA3HDO, will be returning as AMSAT’s Vice President for Human Spaceflight Programs. This role will include AMSAT’s leadership on the Amateur Radio on the International Space Station (ARISS) Program and amateur radio operations pursuits on other Human Spaceflight vehicles proposed by NASA, International Space Agencies and domestic and international commercial spaceflight organizations. Create a new album with your name or call sign and upload your pictures. The amateur radio F-1 CubeSat, built by the FSpace team of young engineers and students at the FPT University, is on its journey to the International Space Station (ISS). It is the first satellite to be built in Vietnam and the project has attracted much TV news coverage. F-1 carries a low-resolution C328 camera for an earth observation mission. The camera is capable of a maximum resolution of 640 by 480 pixels with 8 bit color. Images will be downloaded when commanded by the FSpace ground station. There is a 3-axis magnetometer (developed by Angstrom Space Technology Center, Uppsala University, Sweden) and several temperature sensors. The satellite’s callsign is XV1VN and the communications subsystem is built around two Yaesu VX-3R amateur radio handheld transceivers. One will operate on UHF the other on VHF. Yaesu VX-3R1 transmits on 437.485 MHz FM, it has no battery so will operate on solar power only. As a result it will only be active when the satellite is in sunlight and when active the output power will vary between 0.1 and 0.3 watts depending on the amount of illumination. The antenna is a half-wave dipole. The FM beacon will send Morse code at 10 words per minute every 30 seconds (configurable). A sample of the beacon can be heard here. VX-3R2 operates on 145.980 MHz FM and is connected to Lithium-Polymer (LiPo) batteries so will operate in both dark and sunlight. The power output is 1 watt into a half-wave dipole antenna. Using a TinyTrak4 packet radio modem it will send an AFSK 1200 bps AX.25 packet every 60 seconds (configurable). F-1 was launched along with four other CubeSats in the HTV-3 cargo vessel on an H-IIB rocket from the Tanegashima Space Center, Japan, on July 21 at 02:06 UT and will arrive at the ISS on July 27. It will remain on the ISS until September when it will be deployed by Japanese astronaut and radio amateur Akihiko Hoshide KE5DNI using the ISS Kibo robot arm. F-1 is mounted in a JEM-Small Satellite Orbital Deployer (J-SSOD) with the amateur radio TechEdSat and FITSat-1 CubeSats. In a second deployment pod are WeWish and a scientific 2U CubeSat Raiko. The CubeSats will be deployed into a 400 km orbit and should have a lifetime of 3 or 4 months before re-entering the Earth’s atmosphere and burning up. In this video the team from FPT University sing the song “Vietnam’s orbit”. Artist/singer Trương Quý Hải has supported the F-1 CubeSat project from the beginning and composed the song just a few weeks before the launch. The accompanying music clip was completed just hours before the launch of F1. The team very much appreciated this. High speed data 5840.00 MHz. 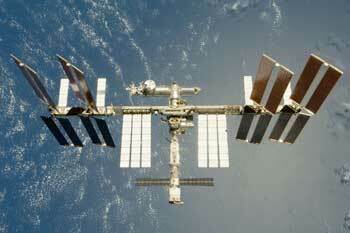 (Sevastopol, Crimea, Ukraine) with International Space Station. as known as a place where Russian cosmonaut Anton Shkaplerov was born. not only to speak but also to see what he was doing on board of the station. Balaklava’s school pennon which he has on board. Vladimir Kovgan and Anton’s first teacher Irina Bogdanova.